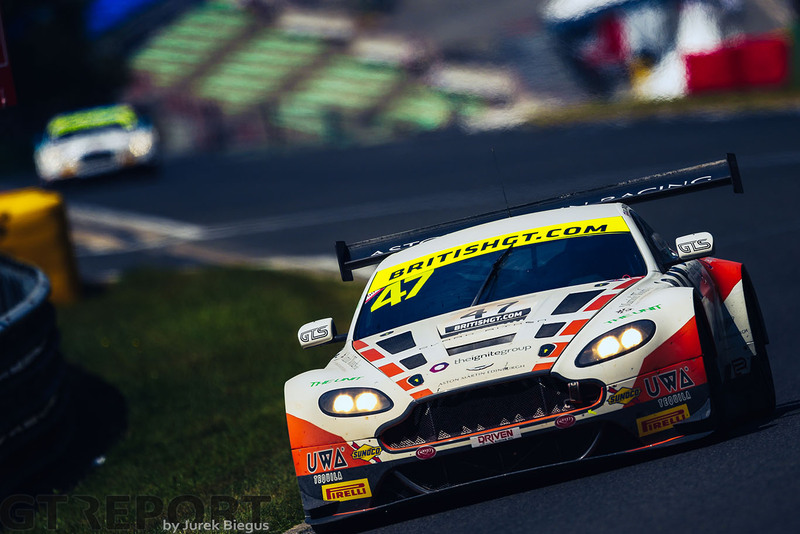 Maxime Martin and Graham Davidson secured their first British GT victory in some style as they negotiated numerous fires and safety car periods in the Jetstream Racing Aston Martin Vantage GT3. 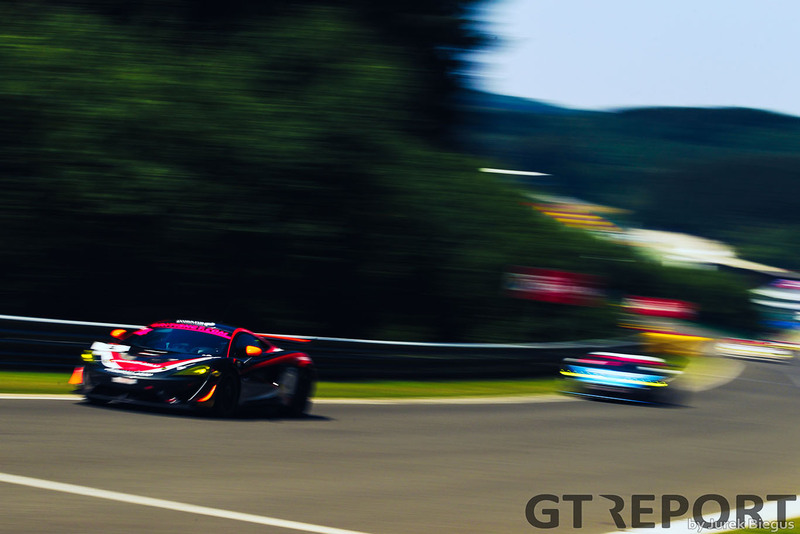 Starting SRO’s Speed Week – leading up to next weekend’s Spa 24 Hours – the two-hour blast around the Ardennes was action-packed from the very first sequence of corners. After what appeared to be a clean run into the right-hand La Source hairpin, the race soon sparked into life as Mark Farmer’s TF Sport Aston Martin spectacularly caught fire on the run down to Eau Rouge. Leaking oil on the track, and with the flames getting ever larger, Farmer was forced to pull the Vantage off at the top of Raidillon. That necessitated the first of two safety cars so the car could be recovered and the oil treated. Leading the race was another Aston Martin, that of Flick Haigh, who had made a solid start to hold off fellow front-row starter Davidson. It was Haigh who made the better of the restart as the McLaren safety car came in after 15 minutes, with Davidson dropping a handful of places as Remon Vos in the RAM Racing Mercedes-AMG GT3 and Ian Loggie in the Team Parker Bentley Continental both got past the Scot. 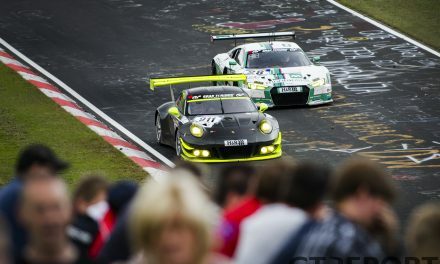 However, the reigning GT Cup champion soon found himself moving back up the order. 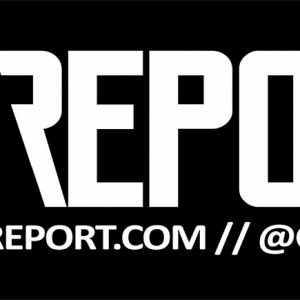 An incident between Jordan Witt’s RJN Nissan GT-R and Loggie dropped the pair down to the lower reaches of the top ten, and when Vos was given a 60sec stop/go penalty for colliding with Farmer at the first corner, Davidson quickly found himself on the rear-wing of the race leader. When Haigh made an uncharacteristic mistake at turn five, Davidson was through. 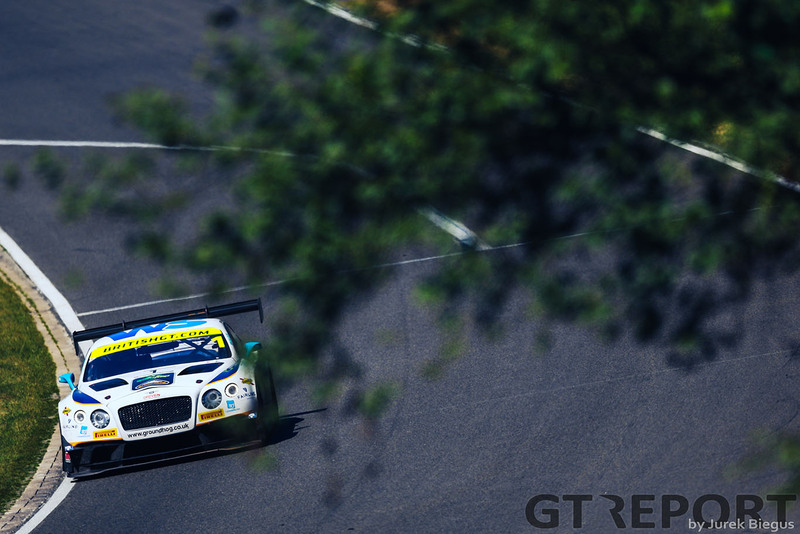 He held the lead until the pit window opened and passed the car over to Martin with enough in hand over Rick Parfitt, who had enjoyed a strong opening stint in the second Team Parker Bentley. Martin only had seven minutes of green flag running at the start of his stint before the safety car was called for again as the Team ABBA by Rollcentre Racing Mercedes of Adam Christodoulou caught fire at Les Combes. 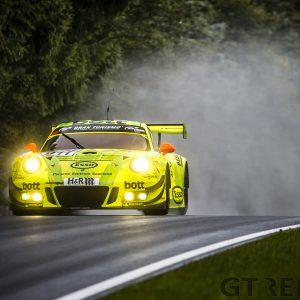 The neutralisation lasted for 24 minutes and the Belgian admitted after the race that he wasn’t looking forward to the restart, but with the cars behind fighting between themselves he pulled clear to take his first win for Aston Martin by almost eight seconds. The battle for the remaining spots on the podium was near-impossible to keep track of for the last 28 minutes of the race as Ryan Ratcliffe – who took over from Parfitt – looked to hold on to his first podium finish of 2018. For a time, his nearest challenger was Yelmer Buurman in the ERC Sport Mercedes. However, he was forced to lift going through Raidillon and lost momentum going down the long Kemmel Straight. The speed deficit dropped him down to the Dutchman’s eventual finishing position of fifth after a great first stint by Lee Mowle. Taking full advantage of Buurman’s slower speed was Marco Sorensen in the second TF Sport Aston Martin. He was lucky to finish on the podium though, crossing the line just 0.057sec ahead of the Optimum Motorsport Aston of Jonny Adam – who had taken over from Haigh. Phil Keen rounded out the top six after a relatively scrappy race for the Barwell Motorsport team. Keen’s co-driver lost a chunk of time in the opening hour after he was hit by the second Lamborghini Huracan GT3 of Sam De Haan. 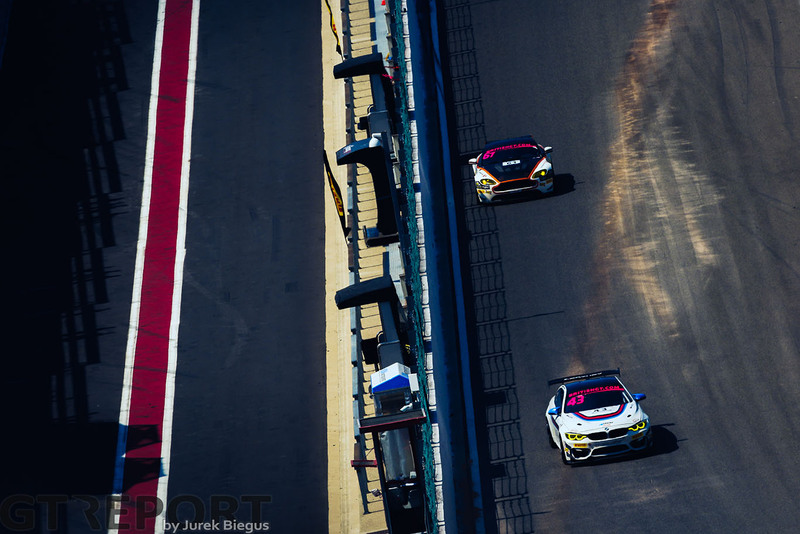 Flawless pit strategy helped Century Motorsport to it’s third win of the season as Jack Mitchell was joined by rapid team newcomer Dean MacDonald to secure class victory for the #43 BMW M4. 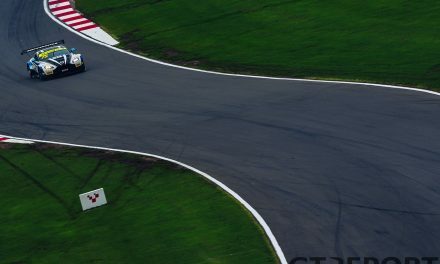 MacDonald moved over from the Steller Motorsport team (who didn’t make it across the channel) to replace Aleksander Schjerpen, who was only competing for half-a-season, and his speed was never in doubt. Electing to stay out later than their GT4 rivals, the pair were in the perfect position to take advantage of the second safety car. Coming out ahead of the safety car, they were effectively a lap up on the rest of the class as they joined the rear of the train behind the safety car. Mitchell’s advantage was significantly reduced in the closing stages, and it was only a great piece of defensive driving that kept the Tolman Motorsport McLaren 570S of Charlie Fagg in second. 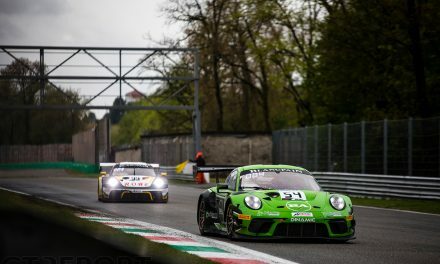 Fagg will be kicking himself with runner-up spot though as the car had started on pole position at the hands of Michael O’Brien – the latter holding the lead throughout his stint. Rounding out the GT4 podium was the Equipe Verschuur McLaren of Finlay Hutchinson and Dan McKay who ran within the top three for the entirety of the race. 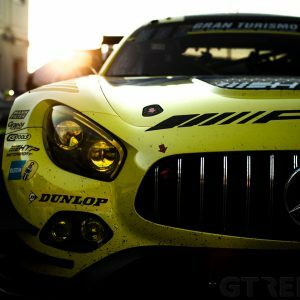 Scott Malvern secured GT4 Pro-Am honours alongside Nick Jones in the Team Parker Mercedes-AMG GT4, with the new ProTechnika team of Anna Walewska and Tom Canning finishing second in another Mercedes. 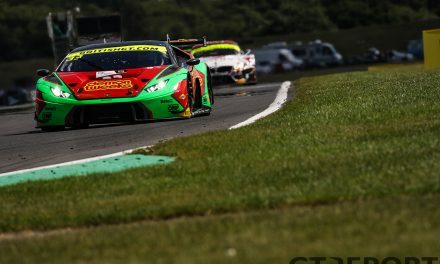 The next round of the British GT Championship is the penultimate event of the season with the field tackling the Brands Hatch Grand Prix circuit on August 4/5.